West Roxbury, Mass.-- Like much of New England, a slushy wintry mix covered Catholic Memorial’s campus on Sunday. The gloom of the weather stopped at the threshold of the front door, though. 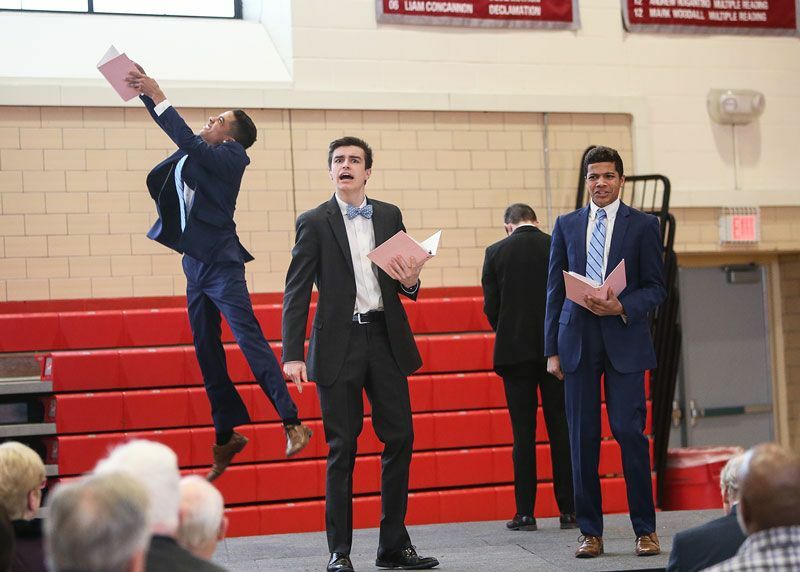 Inside the Ronald Perry Gymnasium, laughter, applause, and celebration filled the air as CM hosted its 19th annual Afternoon of Exceptional Oratory. "It was great seeing everybody come and support my teammates. They showed their love and dedication to the team and for that, I am truly grateful," said Jacob Azzi, a senior and one of the team’s captains. To begin the day, CM’s multiple team of Reid Gutz, Rory Redmond, Darius Gadsden, and Marcus Gadsden performed their reading “White Chicks” to hundreds of fellow students, faculty, parents, and friends of CM. The multiple team has regularly finished in first place at tournaments throughout the year. Following their performance, Azzi and Brendan Julian, the team’s co-captain, presented the Christopher Donlon Award along with the Donlon family. This award is presented annually in memory of Chris Donlon,a member of the class of 2012 who passed away unexpectedly during his junior year. Recipients of the award must be a new member of the team who demonstrates a commitment, and a willingness, to work hard and improve. This year, the team honored co-recipients, freshman Gerald Sewack from Needham and sophomore Ryan Horrigan from Canton. “Usually, we select one student for this award, but this year we felt two were fitting because of the hardwork and dedication they put into this team,” said Julian. Both Horrigan and Sewack compete in the declamation category in speech and debate tournaments. In addition,each is highly involved in CM’s athletic program and student life initiatives. Horrigan is part of the cross-country and swimming teams and Sewack is a member of the Scholars Program. “Gerry, coming in as a freshman, came in super energetic and super happy, and prepared to succeed. I can see his future being bright,” said Julian. On Horrigan, Julian added, “He is a fantastic swimmer and involved in many things around the school. Even though he’s involved in all these other things at CM, he came in every week and signed up for practices. And he worked very hard to qualify for nationals. Following the opening program, more than 50 members of the program presented their pieces duringthree performance sessions. Students in 7th through 12th grades gave performances in poetry, prose, play reading, children’s literature, humorous interpretation, and many more. In addition to showcasing the students’ talents, the Afternoon of Exceptional Oratory is an important fundraiser for the team. 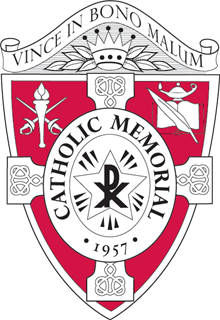 Over the course of the day, CM’s Advancement Office and parent volunteers organized a silent auction and raffle, the proceeds of which directly fund the program. Throughout the year, the team competes in dozens of local tournaments and at national tournaments held at Yale University and St. Joseph’s University. With the program’s success, team members regularly qualify for the national tournaments sponsored by the National Speech and Debate Association (NSDA) and the National Catholic Forensic League. The funds raised on Sunday help defray the cost of entry fees and travel expenses for these tournaments. “When we raise money for the speech team, we give many kids the opportunity to attend local competitions with no cost. It gives national competitors the opportunity to afford trips to Dallas or Kentucky to compete against the nation’s best,” said Rory Redmond, a junior and a member of the program’s leadership team. The team will compete in their last tournament of the year at Needham High School next weekend before heading to the state tournament at St. John’s Shrewsbury next month. Six members of team have qualified for the NSDA national tournament to be held in Dallas later this year.